It’s summer on the west coast, which means we have absolutely perfect days that dim into the most beautiful sunsets followed by breezy nights where the air is sweet with campfires and acoustic guitars. Yes, I am in a mood for smart folk-rock kissed with a taste of California sun. Vanish Valley fits the bill so well that I may throw everything else out the window for the rest of this fast vanishing summer. Andrew McAllister (formerly of Conrad Ford/Tarnished Records) has assembled a group of musicians for something he’s calling a “song cycle” titled, Vanish Valley. The truth is he’s gathered some friends to record a simple, sweet, brief album that should remind you of the sunshine warming your jeans when the cold rain of autumn falls again. 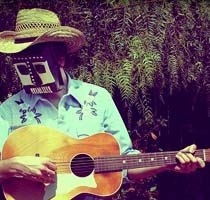 McAllister moved from Seattle to Los Angeles in 2008, settling into his hillside bungalow to write and record. I would normally castigate anyone leaving the Pacific Northwest for Los Angeles (gasp! ), but I simply cannot argue with the results. If this is what LA is inspiring these days then I guess we all need to rethink the city we love to hate. Vanish Valley’s full-length debut album is out on July 27. Vanish Valley: iTunes, Amazon, Insound, wiki, MySpace.